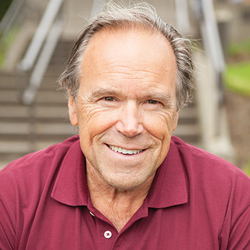 Larry Gulberg earned a bachelor’s degree in chemistry from Stanford University in 1971, and one year later, received his teaching credential from Seattle Pacific. This led him to his first career as a chemistry teacher in the Northshore School District, where he taught until his first retirement in 2003. Larry earned a master’s degree in education and a doctorate in analytic chemistry from the University of Washington. During those years he also worked as an instrument specialist for the Fisher Scientific Company and as a chemistry instructor for Bastyr University. During his 11 years at SPU, he focused on student learning in the classroom and laboratory. His experience as a teacher made him effective in guiding students whose first love was not necessarily chemistry in the department’s introductory courses. Larry has enjoyed bringing theological perspectives to the classroom. Thursday, August 20, 2015, at 9:40 p.m.
Dr. Gulberg is one of the most inspiring professor whom I have ever met. I still remember how he tried to attract students’ interest by blowing up things in almost every class. Fire and explosion are just norms in his class. I remember all the days when I stayed after class to ask him about questions on Web-assignments and the times when we grabbed coffee to talk about life in general. He has certainly been a blessing for my and every student’s life! Thursday, August 20, 2015, at 4:08 p.m. Enjoy your retirement Dr. Gulberg! Herb Kierulff graduated with a bachelor’s degree in economics from Stanford University and went on to manage two departments at Sears Roebuck. He returned to school at the University of Southern California, earning a master’s in business administration and a doctorate in business economics. After graduation, Security Pacific National Bank hired him as their economic research department economist. Later, he moved to the technology division of TRW Inc. Prior to moving to SPU, Herb spent 10 years as a professor at the Marshall School of Business, University of Southern California. He developed the Private Business Valuation Challenge, in which university students from around the U.S. compete to value an actual private company. He has also consulted on a part-time basis throughout his career, mostly in the fields of business planning and turnaround management. His diverse clientele range from inventors and entrepreneurs, to managers and government agencies. Herb is married to a psychologist, Virginia Adams, who helps him with his academic research and writing, and has four grandchildren. Herb credits “his Triune God” for all of his blessings. Tuesday, July 21, 2015, at 9:51 a.m. I do not know where I would be if I did not have Dr. Kierulff as my mentor for both the Private Business Valuation Challenge and my valuation honors thesis this past year. He believed in me from the beginning of these year-long processes; he was always available to answer my calls and patiently explain this or that valuation theory or formula; he was constantly teaching me both financial valuation and how to live faithfully for Christ. Thank you for your dedication to my academic and spiritual growth, Dr. Kierulff! 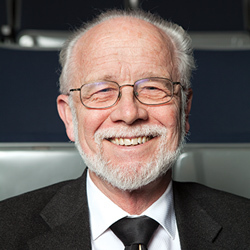 George Scranton has been connected with Seattle Pacific for 50 years. George has been part of theatre at SPU almost since the beginning, having worked with James Chapman first as a student and then as a colleague. He holds degrees in speech (with a drama emphasis) and religion, biblical literature, theatre history and criticism, and theology and theatre. He has also taken stage movement training at Webster University’s American Movement Institute in St. Louis, Missouri, and at the Paddy Crean International Stage Combat Workshop in Edinburgh, Scotland. George began his theatre work at SPC as technical director and designer, though the bulk of his work has been as director, actor, and playwright. He has taught acting, analysis, dramatic literature, movement, and performance — and has frequently hosted students at his home for meals, readings, receptions, and rehearsals. He serves his church, Seattle First Covenant, in numerous ways and brings his ministries of mentoring and teaching together in the classroom and the sanctuary. In retirement, George and his wife, Claire, plan to travel and keep busy with family, friends, and church. Thursday, August 6, 2015, at 3:09 p.m.
George was one of the best professors I had during my time at SPU. I took Actor’s Art with him Fall Quarter of my freshman year and was terrified. He made it such a wonderful and fun experience. His joy and love for his job and students was so amazing! Blessing to you in your next adventure! Monday, August 3, 2015, at 8:05 p.m.
As my Acheiver’s Scholarship mentor, George was an integral part of my first few years at SPU. We hardly weekly check-ins that helped me feel grounded. George’s good humor and friendly face were perpetually welcoming, and his kind words life giving. If you know George, you know he enjoys good food. He taught me that sharing a meal with people is a spiritual thing. As I am serving abroad in Fiji this month, every time I eat with the local people I imagine unseeable connections growing between us, and sweet Jesus love flowing through them. Thank you George for being such an important part of time early time at SPU. I am so glad to know my life was influenced by you! Congratulations on retirement — I wish you all the best! Friday, July 24, 2015, at 6:48 p.m. The very first class I had on campus was taught by Dr. Scranton and he came into the room completely dapper and handsome, then took out his peanuts themed ministers stole and then continued to explain his name is Dr. Scranton NOT Scantron. I knew it was going to be a great class after that. His wisdom and heart for God and students was evident every time he taught. His stories of what SPC used to be like and how he met his wife were fascinating. A student only had to take a class from him one time to know how inspiring he is. There aren’t many like him, and for that I am grateful to have learned from him, if only from one class. God bless! Thursday, July 23, 2015, at 9:01 p.m.
Dr. Scranton is a wonderful theater professor. Upcoming students will be missing a kind and knowledgeable mentor! I even remember going to his house for a class. Thank you and blessings! Born outside Chicago, Tom Trzyna grew up in South Pasadena and attended the University of California at San Diego, where he spent long hours reading on the beach. He transferred to the University of California, Berkeley, in 1966. Before starting graduate studies at the University of Washington, he worked as a bookkeeper and later as a hospital aide in Oakland, and he and his wife spent a year traveling in the U.S. and Europe. 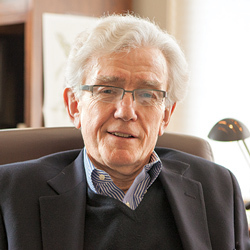 His doctoral work focused on literary interpretations of Christian forgiveness, and he taught at Ohio State University before joining SPU in 1981. Tom’s academic interests include comparative religion and French literature. He likes to work with students on practical applications of the English major, including technical and scientific writing. Among his several scholarly and fiction publications, he is also the author of Baby Bunny Gets a Tattoo — part of a series about a bunny who has unlikely adventures. He and his wife, Martha, have two adult children and four grandchildren. He is a member of Sand Point Community United Methodist Church. Monday, August 15, 2016, at 11:02 a.m. It has been a great honor to learn from Dr. Trzyna. He really worked to break the methodical teacher-student relationship by acting as a wise contemporary to his students. This was often unsettling to students who were used to the traditional style of class, but the class become a close-knit cohort by the end of the quarter. The way that Dr. Trzyna encouraged his students to approach literature often took the form of solving a mystery or a problem. This method elucidated many latent meanings to books often overlooked in a standard literature class. SPU students will miss his classes, but will also miss his kind spirit. Wednesday, August 19, 2015, at 10:24 p.m.
Dr. Trzyna was a teacher who made me laugh and think. My first experience with him was walking into a nearly empty classroom to find him sitting on a table in the front of the room Indian style. After the classroom filled he continued to sit there in silence for several minutes prior to starting class. As much as there were debates and challenges in thinking about literature he bestowed a sense of calm and peace for each and every class I had with him (which were a good half dozen or so). I loved our conversation about the prince and me and hearing about his own endeavors to rescue books from the Half Price Bookstore in Redmond and finding amazing little bookstores in France. Literature has always been a passion but through his classes I learned so much more and have not stopped seeking out classics from around the world. This same passion for literature is something I made sure to bestow upon my own students. Thursday, July 23, 2015, at 7:57 p.m.
Dr. Trzyna and Dr. Young changed my life and taught me invaluable lessons that have made me a better person. Best of luck to you both in whatever future endeavors lay ahead of you! Monday, July 20, 2015, at 9:30 a.m.
Dr. Trzyna was one of my first professors Fall Quarter freshmen year. In a small upper-division class of 9 people, he was incredibly encouraging and challenging, allowing me to speak up and treating me as an equal to the upperclassmen. His challenging thoughts on race relations, ministry, and white privilege have shaped me profoundly and pushed me into a lifelong commitment to social justice. Truly one of the greatest experiences I’ve had at SPU! Thank you, Dr. Tryzna. Tom Wall came to SPU in 2002 to teach as an adjunct instructor in clinical psychology until 2006, when he was hired as an associate professor. During the last dozen years, Tom routinely taught ethics and the law, psychodynamic psychotherapy, personality assessment, and personality theory/personality disorders. 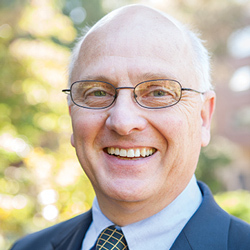 He co-founded the SPFC advisory board, on which he currently serves as chair. Over the decades, Tom also served as a clinical associate professor in the University of Washington’s School of Medicine. 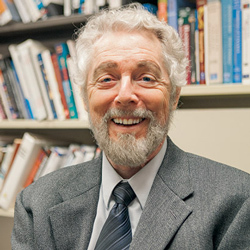 Tom’s scholarly work includes public lectures, workshops, and writings on topics including stress management, clinical hypnosis, and ethical standards in the practice of clinical psychology. Off campus, Tom is a licensed psychologist and independent practitioner. He is an active volunteer, a collector of vintage cars, and an organic blueberry farmer. Magnolia Congregational, where Tom began attending in junior high, is his church home. Tom and his wife, Val, have two grown children. Sharon Young started out as an elementary school teacher and went on to become a math specialist, overseeing 13 elementary schools in Sacramento, California. Sharon earned her master’s degree in curriculum at the University of Denver and her doctorate in mathematics education at the University of Colorado, Boulder. 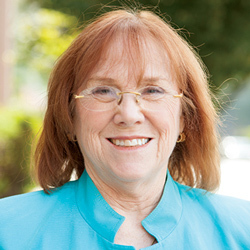 Before coming to Seattle Pacific in 1995, Sharon taught at the University of Colorado, University of West Virginia, and Louisiana State University. She wrote elementary school mathematics textbooks for 15 years. One of Sharon’s loves is children’s literature and she has written 100 emergent reader children’s books with mathematical themes. Sharon has worked on numerous state committees to develop mathematics content standards for K–12 students, and she is currently helping SPU’s Department of Mathematics and the School of Education gain approval for a graduate elementary mathematics specialist program. Retirement plans include writing more children’s books and traveling with her husband, Randy, starting with a trip to Europe this summer. I remember being warned about the expectations and workload in Dr. Young’s class and being told give it a week or two and you will fall in love with her. The warning was so true. She challenged me in such a positive manner and showed so much passion and love for what she did. It truly was a perfect example of the teacher I desired to be for my own students. Future teachers in training are missing out on an amazing gem. I am incredibly grateful for all of the life lessons and additional time that Dr. Young shared with me and countless other students. Dr. Young is a wonderful teacher and practical mathematical professor who showed me how to write good mathematic questions and much more! Thank you and God speed! Wednesday, July 15, 2015, at 11:28 a.m.
Sharon Young was an excellent Elementary Mathematics instructor. She had high expectations for her students. I learned the most applicable content for teaching my special education and general education students. Her mathematics literature collection was also amazing. :) Thank you! Want to wish your former professors well on their retirement? Leave a message on this moderated bulletin board.